Antoni Llueca, Jose Luis Herraiz, Dolors Piquer, Yasmine Maazouzzi and Carmen Medina. 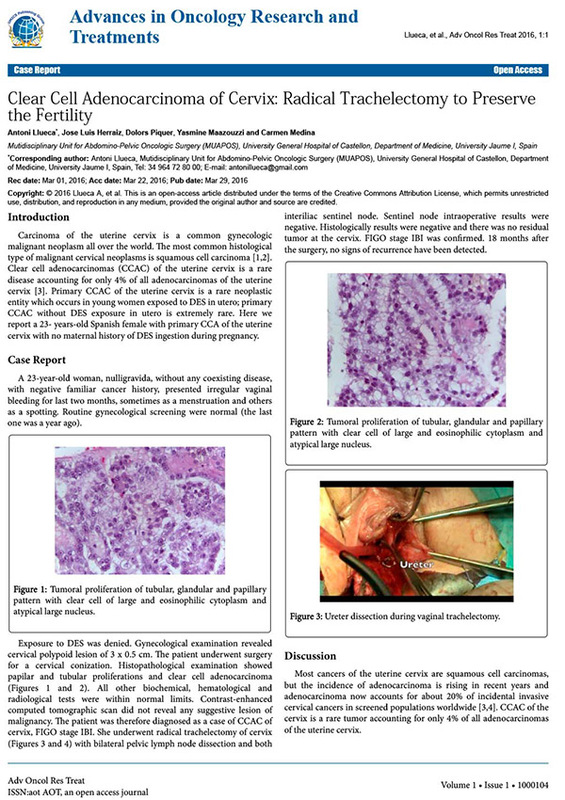 Carcinoma of the uterine cervix is a common gynecologic malignant neoplasm all over the world. The most common histological type of malignant cervical neoplasms is squamous cell carcinoma. Clear cell adenocarcinomas (CCAC) of the uterine cervix is a rare disease accounting for only 4% of all adenocarcinomas of the uterine cervix. Primary CCAC of the uterine cervix is a rare neoplastic entity which occurs in young women exposed to DES in utero; primary CCAC without DES exposure in utero is extremely rare. Here we report a 23- years-old Spanish female with primary CCA of the uterine cervix with no maternal history of DES ingestion during pregnancy.